Great things can be made using pumpkin, but none as simple as this recipe. 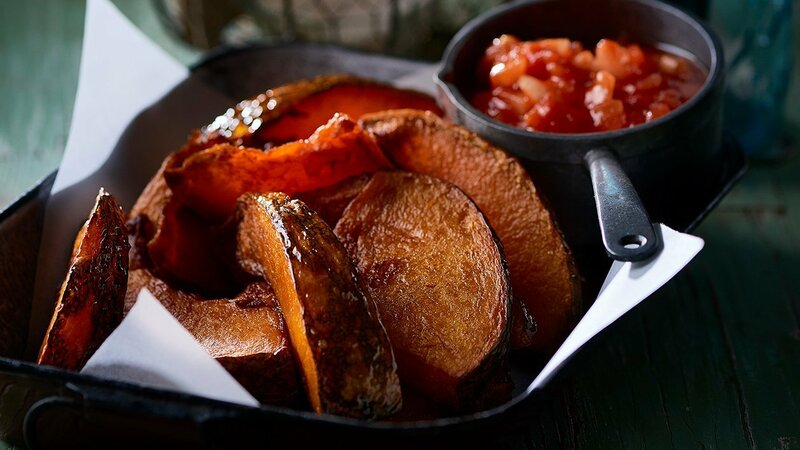 A brilliant substitute to traditional wedges and chips. Clean and chop the pumpkin into wedges, leaving the skin on. Deep fry pumpkin at 160 degree Celsius until par-cooked. Drain. Combine KNORR Pronto Napoli, tomato, coriander, jalapenos, onion and oil to make Pico De Gallo salsa. Return pumpkin to deep fryer to complete cooking at 160 degree Celsius. Drain. Place in a bowl with the salsa and toss lightly to combine. Serve pumpkin drizzled with HELLMANN'S Real Aioli and sprinkle with roasted pepitas. Garnish with extra coriander and jalapeno.